This book encompasses the investing wisdom of John C. Bogle, and it’s an excellent starting point for anyone who wants to invest successfully. Bogleheads’ is written in a cut-to-the-chase style and focuses on building a low-maintenance portfolio. What separates this investment book from the pack is its ability to tune out traditional Wall Street wisdom. This is the updated version, which includes information on backdoor Roth IRAs and ETFs, estate taxes and gifting, plus changes to the laws regarding Traditional and Roth IRAs, and 401k and 403b retirement plans. 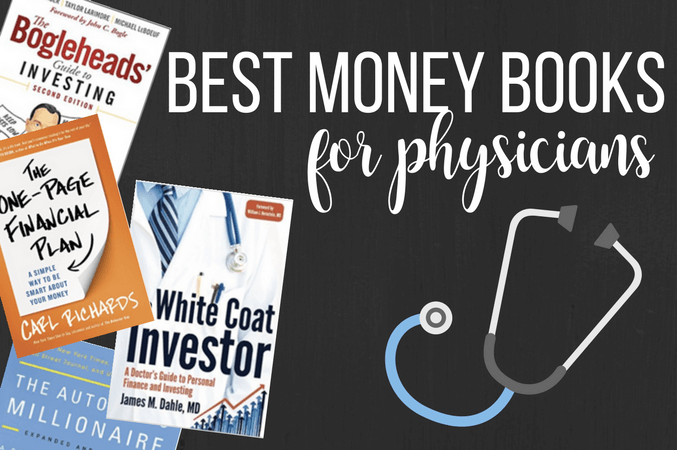 This physician money book is written by a practicing emergency physician and speaks specifically to the financial life of a doctor. It focuses on using your income as a physician to pay off your loans, build wealth and provide for your family. It’s a good read whether you’re in residency or well into your career, but I think every medical student should put this book on their reading list. This book is jam-packed with investing wisdom, plain and simple. You can learn something from this book no matter what investing level you are at. The Investment Answer breaks down into five basic decisions to keep you focused and help you build a profitable portfolio. This one is for the money book hoarders. You might have a shelf full of personal finance books but still feel lost when it comes to your money. This book starts with the big picture so you can make better decisions as you go. And if you enjoy learning everything you can about your finances, this is a good companion for all that information. Ramit’s book is fantastic for all-around financial planning, but I think this is an especially valuable physician money book because it teaches you how to prioritize your spending. It focuses on the essentials of banking, saving, budgeting and investing, and emphasizes the importance of automating payments and spending your money on the areas that enrich your life. The writing is funny, clear and casual, so this is an enjoyable read. Physicians are busy. Automating your funds can be a powerful tool for long term financial success. David Bach’s The Automatic Millionaire is a fantastic guide for a “set it and forget it” approach to your money. This is a great read for anyone who isn’t really into budgeting. You’ll learn how to pay yourself first through automatic processes, which helps you hit your goals on a busy schedule. Your mindset around money can make or break your financial future, regardless of your income. Many physicians get distracted by lifestyle inflation and don’t put their money to work for them. That’s why this book is such an important read for anyone, but I especially like to recommend it for doctors. You have to consider your end goal, your why, and where you hope to be in the long run before making big financial choices. Finding your end goal helps you guide every major money decision you make. Vitug gives you the guidance to use simple tools to take control of your finances. But this isn’t just about making a budget; it’s about adopting a lifestyle that gives you the breathing room to hit your financial goals quicker and more effectively. Work Your Wealth isn’t your traditional personal finance book. Mary Beth Storjohann, CFP®, is a speaker and writer who cuts through the fluff and gives clear, concise financial advice. This book is an excellent option for residents just starting out and trying to sort through their financial futures. Every chapter includes detailed, actionable steps that help you get started immediately on your financial plan. Did your favorites make my list? Is there anything you would add? If you’re looking for more book recommendations, you can check out this book list for students.